A beetle or an STD? Meloe is a genus of beetle which can be called oil beetles or blister beetles. These beetles can be considered parasitic, but really they are just very clever predators and scavengers. Each species of Meloe is highly specialized to hunt bees of a particular species or a few closely related species. Juvenile Meloe beetles form large clumps of worms which roughly approximate the shape of a female bee. They then all emit pheromones which mimic those of female bees of the particular species they are hunting. The unsuspecting males which fly by will approach and be disappointed, however unharmed. The juvenile beetles only want to attach themselves to the unsuspecting male bee. Hopefully he will then find a real female bee and the juvenile beetles will transfer over. When the female eventually returns to her hive the beetles will infest it and feed off the honey and the defenseless juvenile bees. As adults most species of Meloe are completely flightless. Despite the horror movie like childhood the adults live on flowers and only eat pollen. When they are attacked (or picked up) they drip a toxic oily substance which can cause blistering on the skin. 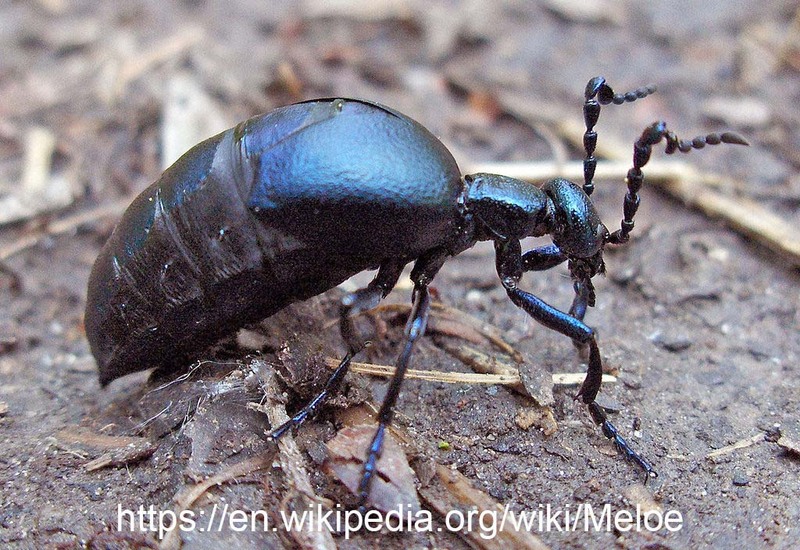 Meloe can be found throughout the Americas and the Palaerctic region.